The 2019 Westminster Kennel Club Best in Show was awarded to Wire Fox Terrier, “King”, GCH Kingarthur Van Foliny Home, by Judge Mr. Peter Green. 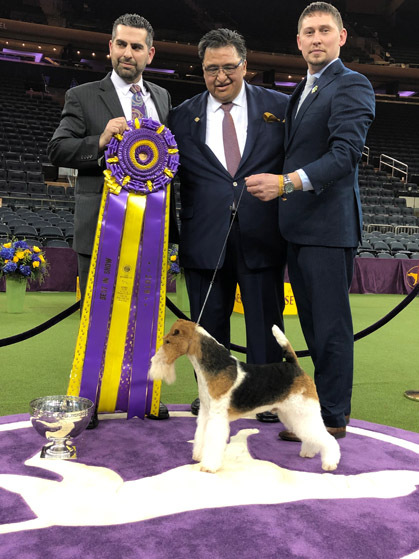 Congratulations to King’s owner Mr. Victor Malzoni, Handler, Gabriel Rangel, and Breeders Mr. & Mrs. R De Munter & D Ulterwijk! Posted by chesliepickett on Feb 13 2019. Filed under Breaking News, Featured. You can follow any responses to this entry through the RSS 2.0. Both comments and pings are currently closed.